Gus is a hobo, often hanging out at Bumbase Alpha. Gus suffers from being mentally ill, rather than drunk as assumed by Bender. Before being a hobo, Gus was a senator in the Earth government, during which time ate at Helmut Spargle's most famous restaurant. Gus is only seen together with his friend, Dandy Jim until the episode, "That Darn Katz!" where he is seen cooking an egg on the sidewalk, while simultaneously being cooked by Horrible Gelatinous Blob. 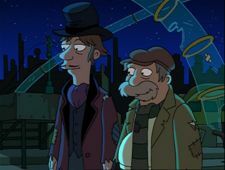 Gus is seen alone in a deleted scene in "Lethal Inspection", in which Hermes and Bender uses him as a shield against the Killbots. Gus: I once et there back when I what-was a senator! Gus: Oh, I'm not drunk, I'm mentally ill. But I likes what what you said. Gus: Okay, but I what warn you. Bullets generally pass right through me. [The Killbots shoot him.] Yes, sir. That just substantiated my thesis. This page was last edited on 26 October 2013, at 15:54.